Frank Productions and Majestic Live are planning to join forces. Photo by Kenneth Casper on Flickr. The two largest live-music promoters based in Madison, Frank Productions and Majestic Live, announced on Monday that they are planning to merge, adding another big gust to a whirlwind of recent changes in Madison's landscape of music venues and concert promoters. When finalized, the merger will give one company direct control of a sizable chunk of Madison's venue space and concert booking, and at least partial influence over a handful of other venues. It's not quite a monopoly, but it's getting harder to see room for competition. The new company will own the 600-capacity Majestic Theatre; the 400-capacity High Noon Saloon, which Frank Productions announced it was buying just over a month ago; the planned new 2,500-capacity venue The Sylvee, scheduled to open in 2018 on East Washington Avenue; and two Columbia, Missouri venues Majestic Live acquired in 2014. But both companies' work already extends well beyond places they actually own. Frank, Majestic, and Frank's True Endeavors subsidiary co-present the annual outdoor concerts at the city-owned Breese Stevens Field (6,000 capacity). Between them, they also book frequent shows at venues including The Frequency (175 capacity), the Barrymore (971 capacity), the Overture Center (2,255 capacity in Overture Hall, 1,089 in the Capitol Theater), and Crescendo on Monroe Street (capacity 49), not to mention the Majestic's popular Live On King Street summer concert series. That's a huge orbit for one company to have in Madison. After the merger, there will be just two other entities regularly booking large touring acts in town: Massive conglomerate Live Nation, which manages the 2,300-capacity Orpheum Theatre and presents shows at the Alliant Energy Center (and sometimes at the Barrymore), and the Wisconsin Union Directorate, which books shows at campus venues including the Union Theater, the Rathskeller, and The Sett. Of course, there are still other promoters working in town, but they tend to be seasonal (think the annual East Side neighborhood festivals), small-time, not heavily focused on the Madison market as a priority, or focused on a specific genre or niche. One exception would be the Stoughton Opera House, which books above its weight and does it in-house. The merger will close in the fall, at which point the parties will announce a new name for the resulting company, Majestic co-owner Matt Gerding says. The two companies currently have offices a few blocks apart downtown, and at times have been seen as rivals. Then again, they've also collaborated a lot over the years, and that's become more frequent recently. The main thing that changes for the new partners internally is greater coordination. Charlie Goldstone, president of concerts at Frank, says the new company will have about 30 employees. "The merger allows us all to work together for the greater good and make sure we are putting the right shows into the right venues," Goldstone, says. "It aligns our priorities together so we can all focus on doing the right things in the right ways." Goldstone also believes the two companies complement each other, which makes sense: Frank works mainly in a world of big artists and national tours. Majestic Live might book its share of bigger-ticket headliners, but through its smaller bookings at places like The Frequency it also works a lot more with up-and-coming acts. When asked to what extent the merger might be a response to Live Nation's presence in town, Goldstone seems dismissive, though he's criticized the multinational in the past. "Competition is a part of any industry," he says. "If Live Nation was not in town and another company felt there was space to be successful, we would be competing with them as well." 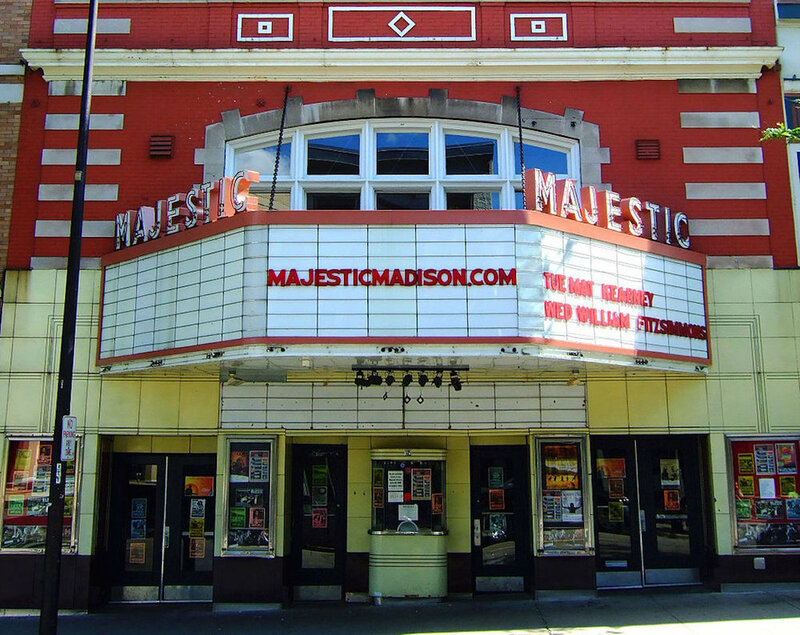 Majestic Live was formed in 2007, when Gerding and business partner Scott Leslie moved to Madison to and bought the Majestic Theatre on King Street. Frank Productions has been in business since 1965 and has more of a national scope, but didn't seem all that interested in actually owning venues until recently. A few years ago it started plotting to build its own 2,500-capacity venue on East Washington Avenue, after losing the opportunity to book at the Orpheum. Those efforts culminated in the recent announcement that the venue will be called The Sylvee. Weeks after that, Frank Productions announced that it was buying the High Noon from founder Cathy Dethmers.